Towards the end of 2015 the 8 Limbs admin staff dedicated 2016 to be a year to internally and externally hold space for difficult conversations. The foundation upon which we rested this commitment was a particular awareness––recognition of our consistent willingness over the years to move beyond our comfort zones and dive deep into what we’ve come to appreciate as our growth zones. Half way through 2016 we can honestly say it’s been humbling. Larger conversations about racial justice in the Seattle yoga community provided us with an access point for a significant portion of this work. Patience, passion and openheartedness on the parts of our community partners have supported us in discovering available pathways and lent us a helping hand when we’ve tripped and fallen, over our own shoelaces in some cases. We began what felt like deep diving into the work of both uncovering and dismantling biases in ourselves and our business model. Riding the crests of these dives we experienced tenderness, love and pride. In the depths of our present-moment-awareness we’ve sat with guilt, shame and embarrassment. Somewhere in the midst of these feeling waves we’ve abided in openness and vulnerability. Our inner witnesses, in turn, have become increasingly tuned into schisms, large and small, in our personal and collective awareness. As I mentioned above, this work has felt like deep diving. That is, however, until the series of hate and fear-induced violent incidents in our nation this past month. Now the conversations we once thought of as depth-plunging almost feel like doggy-paddling in the shallow end with arm floats. Like many others doing this work, we’ve been pulling off layers to expose new levels of awareness in the midst of our country doing the same. Our profound interest to be a healing voice in the conversation is being met with a profound question around what our voice is. Dismantling well-worn paths of biases, isn’t always leading us instantly to new wise seats of stability but often a sense of being in over our heads swallowing water. My role as Executive Director at 8 Limbs is to ensure we’re bringing life and integrity to our mission through what we offer and how we go about our business. Owning this charge, in the midst of such deep diving, led to a deep pause this past week. This pause came in the form of a beautiful conversation in our Leadership team meeting this past Wednesday morning. During our meeting we took a good look at how much we’ve grown, where we’re leaking and also how we’re going to remain distinctly in over our heads (beyond our growth zone and into an overwhelm zone) if we don’t start paying more attention to what we do know. What do we know? An authentically yogic life is a socially just life. Practicing yoga offers tools to cultivate mindfulness in our actions and cultivate the energy to serve one’s dharma or purpose. 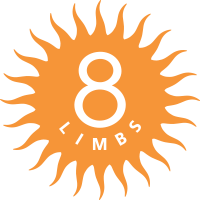 And 8 Limbs exists to support people in finding and following their path – their dharma. Coming up for air in this way proved to be an awful lot like doing a restorative practice–our collective sympathetic nervous system was offered relief making room for our collective wisdom to shine forth. Where we landed is a finessed commitment. We will continue to educate ourselves so we may continue participating as skillfully as we can in the conversations and work around institutionalized bias in the Seattle yoga community. We will do this work too in order to continue offering healing space, support and resources to others in the midst of a fear and hate charged national climate. But rather than rush forward with loud voices we’re pairing this immersive learning with deeper deep dives of another sort – into yoga. More specifically, we’re going back to our roots – first to the yogic concepts that inspired our mission and then to our mission itself. Behind-the-scenes we’re actively unpacking our mission, the heart of 8 Limbs, within these new levels of awareness in order to find our strong voice and how we may better serve our community. During this next period of deep diving we do expect to be publically, at least initially, a bit more quiet. This coming Monday, July 18, though, we have decided to deep dive into some silence. Monday afternoon, at 1:08 pm we invite you to join as we observe 8 minutes of silence to acknowledge the effects felt as a result of hate-based and fear-inspired violence on certain communities. If you are in class with us at this time, your teacher will hold space for this silence. If you are in our reception areas you are welcome to join our administrative staff as they come together in silence. If you are elsewhere in Seattle, or the world, we also invite you to sit in silence with us. From this silence, may our voices grow stronger. For a list of Anti-Racist Resources and Definitions, visit our Blog Post Anti-Racist Resources.